Between the Devil and the Deep Blue Sea was one of my favorite books last year. I loved quirky Violet, deceptive River, and their devil hunting ways. 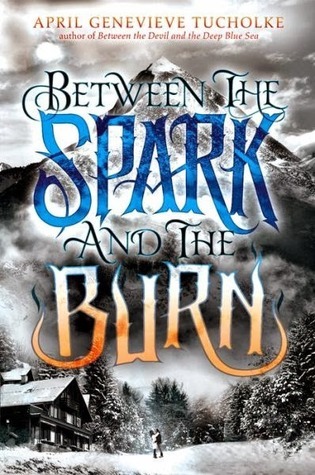 The plot felt so original and after the ending I was eagerly anticipating Between the Spark and the Burn. Between the Spark and the Burn begins a few months after the events of The Devil and the Deep Blue Sea. Violet is at home but she listens religiously to a paranormal radio program every night for any news on River and Brodie. When Neely shows up at her door Violet readily agrees to go looking for River. And that is what this book is about; looking for River, looking for Brodie, looking for answers from Freddie. There was so much looking that I found myself getting reader fatigue. After the first quarter of this book I was tired of looking, I just wanted answers. I wanted to know more about Neely, River, and Brodie’s pasts and I wanted to know how Violet actually felt. For a character that has so much inner monologue I felt she was unnecessarily vague. This vagueness bothered me most when it came to Violet’s back and forth romance with both River and Neely. I wish that Violet had had more definitive feelings toward each boy, instead I felt like her romance paralleled the one that Violet read about in Freddie’s journal. It made me question how much autonomy Violet truly had over her actions or if she was just following Freddie’s format. I would be remiss in this review if I didn’t mention just how lovely the writing was. Tucholke excels at writing very descriptive, lovely, prose. What kept me reading, even when I had fatigue, were the lushly descriptive paragraphs. Overall, while I loved Between the Devil and the Deep Blue Sea, Between the Spark and the Burn was a middle of the road sequel. I liked but didn’t love it. I will definitely be reading whatever Tucholke writes next though because I can’t get enough of her pretty prose!